Stainless steel case with a black rubber strap. Unidirectional stainless steel bezel. Silver dial with silver-tone hands and index hour markers. Minute markers around the outer rim. Luminescent hands and markers. Date display appears at the 3 o'clock position. Quartz movement. Scratch resistant sapphire crystal. Screw down crown. Solid case back. Case diameter: 39 mm. Deployment clasp. Water resistant at 300 meters / 1000 feet. Functions: hours, minutes, seconds, calendar. 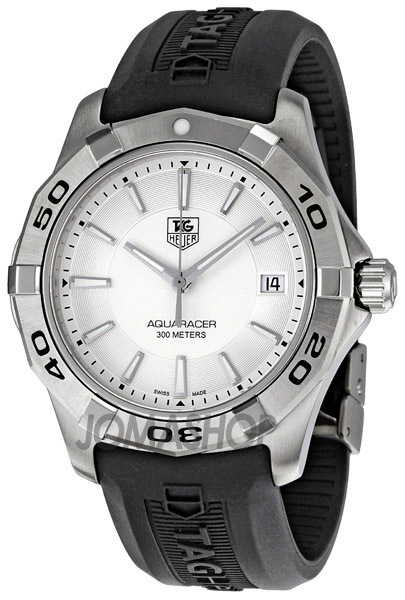 Tag Heuer Aquaracer Silver Dial Black Rubber Strap Mens Watch WAP1111.FT6029.